(March 28): Most Southeast Asian stocks recovered on Tuesday from the previous session's losses, in line with broader Asia, as investors pinned their hopes on US President Donald Trump's stimulus plans after the healthcare policy setback. Singapore led the gains, rising nearly 1% as financials such as DBS Group Holdings Ltd gained as much as 1.6% and Oversea-Chinese Banking Corp added 1%. MSCI's broadest index of Asia-Pacific shares outside Japan rose as much 0.7%. Investors need to monitor Trump's policies closely, because they are not easing concerns, said Teerada Charnyingyong, an analyst with Phillip Securities Thailand, adding the president's policy moves will be in focus at least until the next Federal Reserve meeting. Shares of Singapore Post Ltd, the city-state's e-commerce logistics service provider, rose as much as 1.5%, after it signed a property management agreement with a unit of CapitaLand Ltd to manage a retail mall. CapitaLand gained 1.4%. 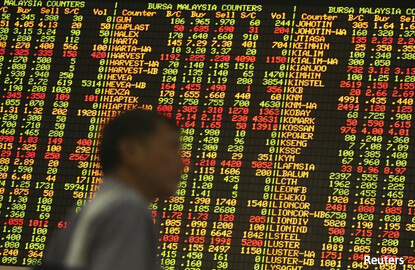 Gains in consumer discretionary and utility sectors buoyed Malaysian stocks, which rose as much as 0.7%, with YTL Corp and Genting Bhd gaining 0.7% and 1.6%, respectively. Thai index rose as much as 0.5%, helped by gains industrial and financial stocks. "The only positive news right now is the fund inflow, maybe from the strengthening of the baht, so that will be a little bit positive sentiment to cushion the market," Charnyingyong said. Thailand's central bank, facing hurdles to changing monetary policy, on Wednesday will likely keep its benchmark rate where it has been for nearly two years, economists polled by Reuters forecast. Philippines rose as much as 0.8%, supported by financial and industrial stocks. BDO Unibank Inc rose as much as 2.1%, while Metropolitan Bank and Trust Co added 2.5%. Bucking the trend, Vietnam fell as much as 0.3%, hurt by financial and consumer staple stocks. Indonesia was closed for the holiday.